Cigar Review: Ezra Zion Tantrum P.A. Ezra Zion has been around for a while now, but looking through our hundreds of reviews, somehow we’ve never written up one of their cigars. So let’s change that today. The Tantrum P.A. 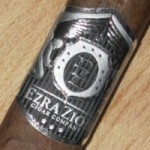 is a follow-up to the original Tantrum, released last year by the Ezra Zion, which is distributed by House of Emilio. Tantrum comes in a single petit corona size called Prensado Pequeño and sports an all-Nicaraguan blend featuring a seven-year-old wrapper. The “P.A.” (short for Passive Aggressive, as opposed to the fully aggressive Tantrum) also comes in one size: this time 6.5 inches long with a ring gauge of 44 and a box press. It’s a Nicaraguan puro with a Cuban-seed Corojo ’99 wrapper. The cigar is sold in boxes of 28 with a planned annual production of just 700 cigars. The Tantrum P.A. carries a suggested retail price of $9.95. I smoked two for this review, both provided by Ezra Zion. Pre-light there is quite a bit of cinnamon and sweetness. Once lit, I find a medium-bodied combination of leather, slight clove, earth, and roasted nuts. The flavors don’t change much over the hour-plus of smoking time, but the cigar has complexity, with a multi-layered profile. Tantrum P.A. actually reminds me quite a bit of the 2013 Illusione Singulare (which I recently smoked for a Quick Smoke between the samples I smoked for this review), probably in part because it’s from the same factory and a similar size. Neither of my Tantrum P.A. samples had any construction issues. What really stands out is the copious amount of dense, palate-coating smoke, and a sweet, almost molasses-like, aroma. I’ll admit I haven’t had many Ezra Zion cigars, but what few I have impressed me. This is no different, and it makes me want to give a better look at some of their other offerings. While the price prevents it from being a great value, it is a thoroughly enjoyable smoke. That earns the Ezra Zion Tantrum P.A. a rating of four stogies out of five.